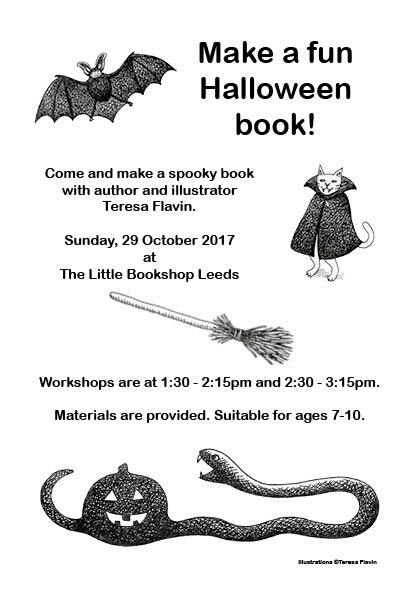 Are you looking for fun creative Halloween workshops in Leeds for the kids? On Sunday the 29th of October, I will be leading two fun and free art and bookmaking workshops at the brand new Little Bookshop in Chapel Allerton. We will be making simple but cool books that kids can write their spooky Halloween stories into. I will be drawing cute spooky characters and showing how you can make your own characters. All materials are included and children between the ages of 7 and 10 are very welcome. The first Halloween art workshop is at 1:30 and lasts for 45 minutes and the second starts at 2:30. All you need to do is contact The Little Bookshop to reserve your places. See you there! Please click on the image for a downloadable and printable PDF.